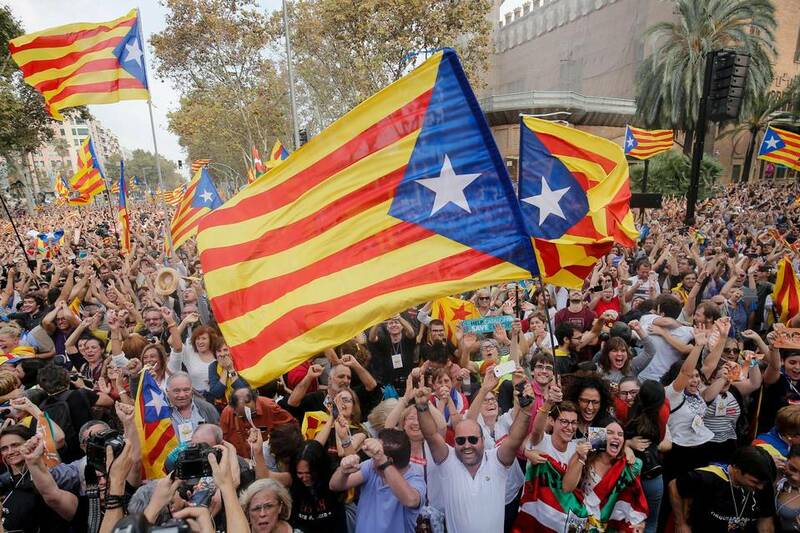 Thousands of people who have gathered outside Catalonia’s parliament building in support of the region’s independence bid cheered and danced after the parliament passed a motion saying it wanted to establish the independent Catalan Republic. Regional President Carles Puigdemont and Vice President Oriol Junqueras exchanged congratulatory embraces and handshakes after the vote, which saw 70 out of 135 votes in favour of independence, 10 against and 2 blank ballots. Most opposition lawmakers had left the chamber in protest moments before the vote. Catalonia’s regional parliament has passed a motion saying they are establishing the independent Catalan Republic. Separatist lawmakers erupted in applause as the vote was approved with 70 votes in favour of independence, 10 against and 2 blank ballots. Most opposition lawmakers had left the chamber in protest moments before the vote. The motion calls for beginning an independent process that includes drafting Catalonia’s new top laws and opening negotiations “on equal footing” with Spanish authorities to establish cooperation. algo que tampoco sabías. La soberanía de toda España reside en todo su pueblo, y eso también es democracia.